The Crimean War of 1853-1856, overall unsuccessful for Russia, nevertheless left history with fine examples of feats of arms, one of which is the now largely forgotten heroic defense of Novorossiysk in January of 1855. It should be noted that the “hot” Crimean war on the Caucasian coast was preceded by a 25-year-long “cold” war between Russia and England. After the war of 1828-1829, a peacetime treaty between Russia and Turkey transferred the Black Sea shoreline from the Kuban delta to the Saint Nicholas harbor, inclusive, into permanent proprietorship of the Russian Empire. This ran counter to the ambitions of Great Britain, which wished to make the Caucasus its own quasi-colony. The British embassy in Instanbul financed the counter-Russian forces and organized the smuggling of arms and ammunition to Caucasus rebels, including even canons. To counteract this and defend the seaboard, the Abkhazian expedition was commissioned. It was charged with organizing a sea patrol along the eastern shores of the Black Sea, in other words becoming a naval border police for the interception of contraband. The expedition was assigned light vessels of the Black Sea fleet: lugger frigates, cutters, brigs and corvettes, for a total of 10 units. The expedition consisted of two detachments, based at Sukhumi and at Gelendzhik. After the founding of Novorossiysk in 1838, the Gelendzhik detachment was transferred there. Between 1831 and 1839, fortifications were constructed along the Black Sea coastline from the Kerch Straits to the Turkish border. Many of these subsequently became resort towns and villages: Anapa, Novorossiysk, Gelendzhik, Tuapse, Sochi, Gagra. Novorossiysk became the center of the coastline. The fortifications were far from deserving the name "coastal fortress.” The field artillery’s caliber and range were no match for the enemy ships, and the fortification walls, consisting of two wattle fences 1.5-2 m apart, with packed earth in the middle, could not withstand the barrage of large-caliber naval weaponry. But the garrisons were eager to take on any foe in battle. They would soon have an opportunity to do just that. On the night of October 16, 1853, Turks attacked the Saint Nicholas outpost, which marked the end of the coastline. The entire garrison heroically fell in the ensuing nighttime battle. Arriving to assist on October 20, the steamship "Kolchis" found itself under Turkish fire. An unfortunate maneuver ran the steamship’s nose aground directly in front of the outpost. Marines shelled the outpost with guns and short rifles, since there were no canons in the ship’s bow. To bring the ship afloat, the fore mast had to be cut down, and chains and part of the coal thrown overboard. In three hours the “Kolchis” was afloat, shelled the outpost with onboard canons, and even managed to sink a Turkish sailboat with a boarding party, after which it left for Sukhumi. The battle of the steamship “Kolchis” with a Turkish coastal battery on October 20, 1853. After the English and French fleets entered the Black Sea, the commander of the Main Naval headquarters, Admiral A. S. Menshikov, gave the order immediately summoning to Sevastopol all vessels assigned to the Black Sea coastline. That sealed the fate of the "fortresses” – the garrisons were left with no means of communication with other fortifications and were simply consigned to starvation, as supplies and provender were delivered only by sea. As a result, between March 3 and 5, 1854, a fleet detachment evacuated the garrisons from all Black Sea coastal fortifications, together with the civilian population – a total of over 5000 people with private and state property. The fortifications themselves had to be destroyed. Even though Novorossiysk was considered the main Black Sea coastal fortification, it was rather tenuously defended. There were no sea-facing fortified walls at all. The garrison had to hastily mount artillery batteries to repulse attacks from the sea. A marine battery was taken outside the fortification, to the Cape of Love region. It had the most powerful and long-range artillery. Novorossiysk was not disturbed by the enemy until January 8, 1855. On that night, the French steam corvette “Helicopter” and the English steam-frigate “Leopard” entered Tsemes Bay. A message was dispatched from the ships, stating that starting January 18 of that year, all ports of the Black and Azov Seas, including Anapa and Novorossiysk, shall be blockaded. 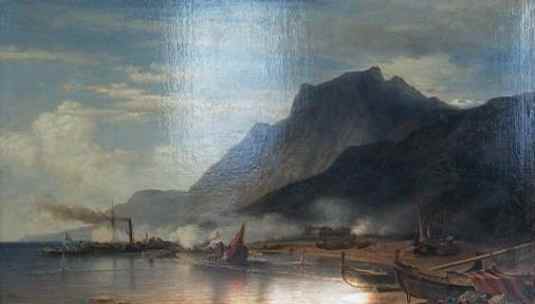 On the morning of February 28, 1855, an enemy squadron entered Tsemes Bay. It included a French paddle-wheel steamer with two armaments and four English vessels: a 20-canon paddle-wheel steam-frigate, a 28-canon frigate and 13-canon corvette, both propeller-driven, and a 4-canon gunboat. Major-General A. O. Debu, who was in charge of the Novorissiysk garrison, sent a courier with a message for Anapa, and ordered the evacuation of all civilians. The men who remained were mobilized and armed on par with soldiers of the garrison. The enemy ships anchored and immediately opened fire on the city. The gunboat, moored with its starboard side facing the marine battery, began shelling it with bombs. The battery fired several rounds in response, but the shells could not reach a single one of the vessels. Other batteries did not even attempt to return enemy fire. The unanswered bombardment of the city continued all day and night, until the morning of March 1. Many buildings in the city were damaged, but the marine battery sustained only one destroyed gun platform. On the morning of March 1, the enemy ships approached the marine battery for a canister round, at which point the battery armaments returned fire and incapacitated the gunboat. At 2 o'clock in the afternoon the enemy ceased fire and went back out of range. Shots continued to ring out only from the paddle-wheel frigate, not causing any serious damage. Only on the morning of March 3 were the enemy ships able to leave the bay, and that with the corvette being towed by the frigate. Six people died on the battery, and six were wounded. Almost all the buildings in town were damaged. The hospital and the armory suffered the most damage. Major-General A. O. Debu reported, "In the entire course of the bombardment of Novorossiysk I witnessed exemplary spirit in the troops of its garrison. The gunmen’s deeds speak for themselves, displaying their perseverance in resisting an enemy which both outnumbered and outgunned them. The Emperor Alexander II ordered the lower ranks of the Novorossiysk garrison be each issued a ruble in silver as reward. Officers had to wait for their reward for over a year. An Anglo-French squadron landed an assault force on May 12, which occupied Kerch. Crews sank the moored steamships "Moguchiy" and "Donets". The steamship “Berdyansk” managed to sail out of Kerch in time, but pursued by the enemy, it, too, was destroyed. With it perished the archives and coffers of the Black Sea coastline. Such a dramatic turn of events meant a real possibility of an enemy landing force even in Taman. As a result, the decision was made to abandon Novorossiysk. The garrison and residents left Novorossiysk on May 15. All fortifications had to be blown up, and remaining buildings and property burned. That ended Novorossiysk's participation in the Crimean War. Source: www.kliper2.ru, author: S. A. Saneev, abridged account by V. Dodonova, from materials of the "Military History Journal” ¹ 7, 2006.